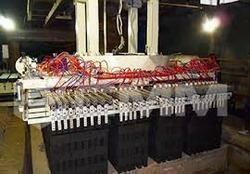 The pneumatic brick setting machine is our latest full-automatic brick setting machine. Based on mechanical, pneumatic and electric control, Wangda full-automatic pneumatic brick setting machine adopts man-machine conversation operation mode with full automation from clamping to stacking. It is employed for the automatic stacking on kiln cars or drying cars and the stacking mode can be personalized design according to kiln cars’ specification.